Madison Chock and Evan Bates compete in free dance during day three of the ISU Grand Prix of Figure Skating Final 2014/2015 at Barcelona International Convention Centre on Dec. 13, 2014 in Barcelona, Spain. Six years. That’s how long it’s been since the U.S. qualified as many as six entries to the ISU Grand Prix of Figure Skating Final. That’s also how long it’s been since the U.S. had the highest number of entries of any country in the Grand Prix Final. And it’s the last time the U.S. won more gold medals than any other nation in the six individual events leading up to the final. All three droughts ended Saturday night as the six grand prix events came to a close at the NHK Trophy in Nagano, Japan. Team USA wrapped up the individual-event portion of the series with 15 medals and 10 skaters headed to the Grand Prix Final – two individuals and four teams. The U.S. athletes who qualified for the Dec. 10-13 final in Barcelona, Spain, are Gracie Gold and Ashley Wagner in ladies; Alexa Scimeca and Chris Knierim in pairs; and Madison Chock and Evan Bates, Maia Shibutani and Alex Shibutani, and Madison Hubbell and Zach Donohue in ice dance. The last time the U.S. had such a successful showing in the grand prix series was in 2009 when world and Olympic medalists such as Evan Lysacek, Johnny Weir, Meryl Davis and Charlie White, and Tanith Belbin and Ben Agosto were competing. That year, the U.S. won six gold medals leading up to the final, just as it has this season. Since 2009, the highest number of entries the U.S. has qualified to the final was four in 2011 and 2014. At this weekend’s NHK Trophy, Scimeca and Knierim earned bronze behind Canada’s Meagan Duhamel and Eric Radford and China’s Yu Xiaoyu and Jin Yang. With their silver-medal performance at Skate America in October, the Americans qualified to the final as the fifth-ranked pairs team of the season. The last U.S. pairs team to make it to the Grand Prix Final was Keauna McLaughlin and Rockne Brubaker in 2007. Also in Japan, the U.S. won gold and bronze in ice dance. The Shibutanis took their second career grand prix win in their six seasons on the circuit; their first win was at the 2011 NHK Trophy. Hubbell and Donohue earned bronze behind Russians Ekaterina Bobrova and Dmitri Soloviev. The Shib sibs were second at Skate Canada last month. Hubbell and Donohue won Trophee Eric Bompard two weeks ago in Bordeaux, France. The event was cancelled prior to the free dance due to the terror attacks in Paris, and the results were based on the short dance. The two teams qualified fourth and fifth out of the six teams heading to the final. Fellow American ice dance team Chock and Bates qualified in second with a win at Skate America and second-place performance at Cup of China. This is the first time in the event’s history the U.S. qualified three ice dance teams to the Grand Prix Final. 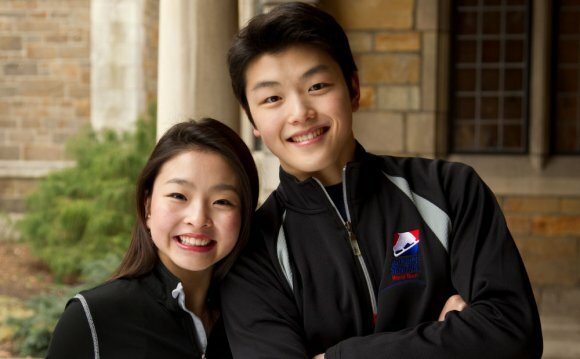 Chock and Bates won silver at their first Grand Prix Final last season. The Shibutanis have twice competed at the final, with their best finish being fourth last year. Hubbell and Donohue will be competing at their first final. Courtney Hicks won silver in Nagano for her career-first grand prix medal and is third alternate to the final in the ladies field. Wagner was fourth at NHK Trophy, which, combined with her Skate Canada win, helped her snag the last spot in the final. She is the first U.S. woman to qualify for four consecutive Grand Prix Finals. Wagner won silver in 2012, followed by bronze the next two years. She also finished fourth in 2009. Gold won Trophee Bompard (short program only) and was second at Skate America, and qualified as the top-ranked woman. This will be Gold’s first Grand Prix Final. She qualified last season but withdrew due to a stress fracture in her left foot.